S&P Global Platts Senior Editor Sameer C. Mohindru takes a look at the potential impact of US steel and aluminum import tariffs on trade flows. 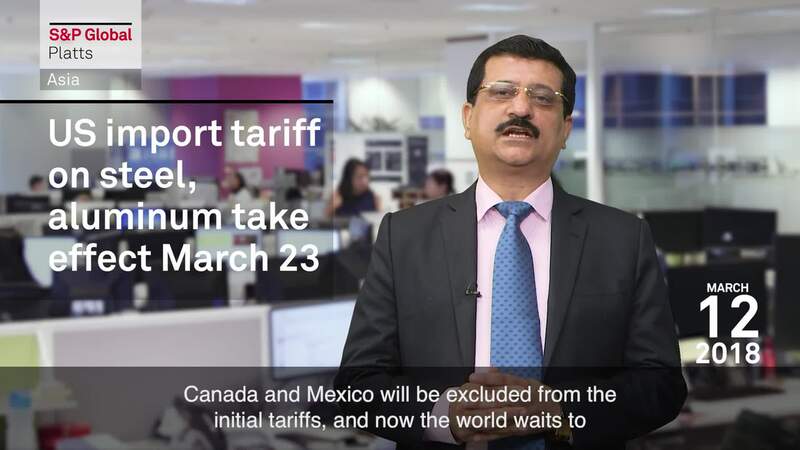 With Canada and Mexico excluded from the US' steel and aluminum import tariffs effective March 23, the world waits to see this week if any other exceptions will be made, and whether exporting countries such as China will retaliate with counter-tariffs on products imported from the US. A trade war could threaten trade flow between the two countries and put the US’ dependency on Chinese markets at risk. More details in our factbox: Trump's metal tariffs put spotlight on US-China commodity trade. The highlights this week: we’ll take a look at the potential impact of US steel and aluminum import tariffs. Are we seeing the beginning of a trade war? What other policy changes await markets? All eyes are on the metals market as the US has imposed a stiff 25% tariff on steel imports, and 10% on aluminum imports. Prices have spiked after US President Donald Trump signed the proclamation on higher tariffs effective March 23. Canada and Mexico will be excluded from the initial tariffs, and now the world waits to see this week if any other exceptions will be made, which countries will request exemptions, and whether exporting countries such as China will retaliate with counter-tariffs on products imported from the US. Here’s our social media question this week: Are you expecting Trump’s steel tariffs to spark a trade war between the US and China? Share your thoughts on Twitter with hashtag PlattsMM. A trade war could threaten trade flow between the two countries and put the US’ dependency on Chinese markets at risk. After all, China is the fastest-growing buyer of US crude. S&P Global Platts Analytics also estimates that China has accounted for 21.5% of US LNG exports so far this year, putting Beijing on track to becoming the largest US LNG buyer for 2018 – details of this are in our factbox on Platts.com. While it's too early to see any impact on trade flows, note that China will be releasing its latest set of oil data this week, and import and export data will follow in the next few weeks. Speaking of data, OPEC will also be releasing its latest monthly oil market report this week, at a time when crude production is recovering in Libya and Nigeria. Higher output can further dampen the current bearish market sentiment. Our latest OPEC survey shows that February crude production in Libya surged to a nearly five-year high and Nigeria to its highest level in 28 months. The IEA's oil market report will be released on Thursday. Over the weekend, China has removed the two-term limit for its president. How would this move affect Beijing’s policies on commodities? Thermal coal traders are waiting with bated breath to see whether any policy change will emerge before China’s National People’s Congress meeting ends this week. Buyers are avoiding new purchases of imported thermal coal, fearing they may burn their fingers in the event of a policy change. Prices of Australian coal, delivered into China are already declining. Still on China, this time in petrochemicals -- Beijing’s partial implementation of a new tax regime for oil products from this month, has dented demand for gasoline blendstocks such as isomer-grade and solvent-grade mixed xylene. The new system is designed to close loopholes which have until now allowed independent refiners and blenders to avoid paying a consumption tax by passing off one product as another. That’s it for this week. Thanks for kicking off your Monday with us and have a great week ahead.